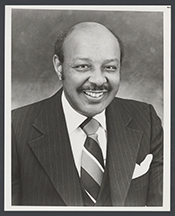 STOKES, Louis, a Representative from Ohio; born in Cleveland, Cuyahoga County, Ohio, February 23, 1925; educated at Cleveland College of Western Reserve University, 1946-1948; J.D., Cleveland Marshall Law School, 1953; served in the United States Army, 1943-1946; admitted to the bar in 1953 and commenced practice in Cleveland, Ohio; lecturer and writer for universities and bar associations; elected as a Democrat to the Ninety-first and to the fourteen succeeding Congresses (January 3, 1969-January 3, 1999); chair, Select Committee on Assassinations (Ninety-fifth Congress); chair, Committee on Standards of Official Conduct (Ninety-seventh, Ninety-eighth and One Hundred Second Congresses); chair, Permanent Select Committee on Intelligence (One Hundredth Congress); was not a candidate for reelection to the One Hundred Sixth Congress in 1998; died on August 18, 2015; lay in state in Cleveland City Hall, Cleveland, Ohio, August 24, 2015; interment in Lake View Cemetery, Cleveland, Ohio. Fenno, Richard F. Going Home: Black Representatives and Their Constituents. Chicago: University of Chicago Press, 2003; Louis Stokes in Black Americans in Congress, 1870-2007. Prepared under the direction of the Committee on House Administration by the Office of History & Preservation, U. S. House of Representatives. Washington: Government Printing Office, 2008.